The best geisha makeup tutorial for creating a traditional or modern geisha look that is beautiful and unique. 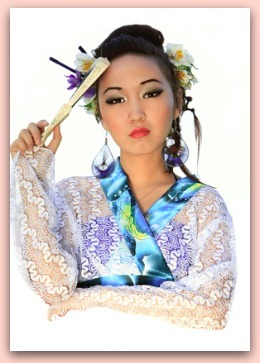 Geisha makeup is an easy yet elaborate look that holds a lot of cultural significance. A Japanese geisha is an entertainer, an elegant and quiet woman who entertains with song and dance. Geisha are a very important part of Japanese culture. If you are planning to attend an authentic Japanese party or festival, it is best if you stick with the traditional geisha look without altering anything. If you are dressing up for something more informal like Halloween, have fun playing with colors and slightly different looks until you find one you like. We'll show you how to pull off both traditional and modern geisha looks. Traditional geisha wore simple makeup. They began by covering their faces and necks in white rice powder until they were stark white. This is the basis for a true geisha look. After the foundation was set, red eyeshadow would be applied to the outer half of each eye, blending outwards until the shadow flowed. Then, geisha would apply a black eyeliner to their eyelids, following closely the curve of their almond eyes, and then creating small wings at the outside corners. Following this, a true red lipstick that matched the eyeshadow would be applied to their lips. This completed their look, once their hair was done up and kimonos were put on. 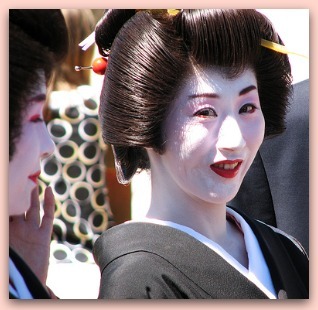 Traditional geisha makeup is stunning, but also a bit harsh with the bright white against deep red. If you want to have a pretty look that resembles a geisha, you can try a more modern twist on the look. For a Halloween geisha face, you will need a few things. The first thing to do is choose a foundation that is a good three shades lighter than your natural skin tone. This will make your face light and pristine like a geisha, but not quite so deathly white. Apply the foundation all over your face and neck with a foundation brush. You might need someone to help you with the back of your neck. Then, apply a very light loose powder over the top to set it, blending well. The next thing to do is to use an eyeshadow to fill in your brows. Pick a matte color that is a couple of shades lighter than your natural hair color. A thicker brow will make you look more youthful and defined. Once this is done, you are ready to apply your eyeshadow. You will need a light beige, yellow, and either a pink or purple color. These will make a pretty look that resembles a flower on your eyelids. Apply the light beige color from your lids up to your brow bone. Then, dab the matte yellow eyeshadow around the middle part of both lids, and blend it in so there are no definitive lines. Take your pink or purple matte shadow, and apply this about three quarters of the way across your eye, spreading it lightly past the outside corner of your eye. Swipe it beneath your lower lash line as well, but only past the three quarter mark of your eye. Use a clean eyeshadow brush to make sure your colors blend well. Next you will want to apply liquid eyeliner with either an eyeliner pen or an angled liner brush. Create the shape of a wing on each eye, and then use the pen or brush to fill in the shape. This will create a beautiful almond shaped eye that represents a geisha. The next thing to do is apply false lashes after the eyeliner has dried to give you an exceptionally pretty costume look. Throw on some light lipstick that goes well with your choice of eyeshadow, pink or lilac are good options. The last optional part of this costume look is flowers. Many geishas wore flowers, baubles, and other decorations in their hair. You can find fake flowers at almost any craft store, so spend some time looking for delicate Japanese flowers that you can use. It is a good idea to make your eyeshadow colors match or compliment your flowers. Once you have done up your hair, place so flowers neatly arranged on the side of your head or where your pulled back hair meets a bun or bulge. If you would like, you can also apply large flowers to the side of your face, which will frame your eyes and lips. Start by removing the bottom layer of petals, and use a little lash glue to stick it onto your face. Then, take the top flower piece and glue it over the bottom petals. You can practice arranging these in many different ways over your face for a pretty geisha makeup look.